I’ve always found it odd that modern society tends to focus more on the death dates for influential people rather than their birthdate. As many of you already know, today (April 5th) is the 21st anniversary of the death of Nirvana frontman, Kurt Cobain. I had been planning on writing up a post featuring short reviews for each of the band’s releases but as many of my project posts tend to do, it got lost under the clutter. Let me start off with some random thoughts. Nirvana is by the far one of the most influential rock bands of the modern age. Despite their relatively short career, they made a huge impact on rock music as we know it and shook up the world’s idea of what it could be. However, as much as Nirvana wouldn’t be Nirvana without Kurt, you can’t forget the folks who made the band come together, even if their stay within it didn’t last long. It was their contributions that helped push the band into what we know it as today. Aaron Burckhard: An early drummer for the band whom was replaced by Chad Channing. You can find some of his work on the band’s “With The Lights Out” via the early live recordings. He eventually played in the band Attica which released an LP in 2005. Chad Channing: Drummer for the band between 1988 and 1990. While it’s not been easy to track details on where he’s been since (or even before Nirvana), it seems he has spent time in the Fire Ants on the EP, “Stripped” which was released in 1993. Dale Crover – Dale jammed with nirvana in the early years while being a full time member of The Melvins. He’s released some solo material and also plays in numerous bands, including Sawed Off, Deaf Nephews and Plainfield, to name a few. Dan Peters: Drummed and jammed here and there for the band but is well known for being the drummer for Mudhoney. This guy has some solo stuff out as well as material with Bundle of His, Love Battery, Feast, Screaming Trees and others. Jason Everman: Played guitar for Nirvana after the recordings for “Bleach” and even paid for its production. He left the band after a tour and joined up with Soundgarden, whom also parted ways with him after a lengthy tour. Everman played in a few other bands, including Mindfunk and O.L.D., but eventually pursued a career in the military and the Special Forces, carrying out missions all over the world. Honestly, this guy’s story is incredible. Georg Ruthenburg: Better known as Pat Smear, he became nirvana’s touring guitarist, helping Kurt focus on solos and vocals. Pat was already a legend prior to joining up with the band, having been in the famous punk band, The Germs. Pat has also spent time in the Meat Puppets, Holez, Foo Fighters (with Dave Grohl), and others. Krist Novoselic: Played bass for the band since its inception. He’s still quite active, jamming in groups all over the place, including the reunion of the band Flipper. Dave Grohl: Known obviously for being Nirvana’s final drummer and the frontman for Foo Fighetrs, Dave had a career in music prior to Nirvana in the bands Dain Bramage, Scream and Harlintox AD. He has since jammed with the Crooked Vultures Queens of the Stone Age. L7 (on live shows),Tom Petty and others. Primarily, this includes three singles: “Love Buzz”, “Blew” and “Sliver.” If you’re hunting for these, forget finding an original copy of the first single. You’ll pay thousands and these tracks reappeared on their first LP. “Sliver” has been reissued in recent years and the 7” edition is pretty good, especially for the hidden phone conversation at the end. There is a version that was released on CD in Germany via Tupelo Records that features some rare live material from an early show that has yet to appear elsewhere. “Blew” is a good find but again, nothing too new here. The debut album featured some raw and gritty tracks. The sound here is rather unique in my opinion as it really didn’t appear on later studio LPs. 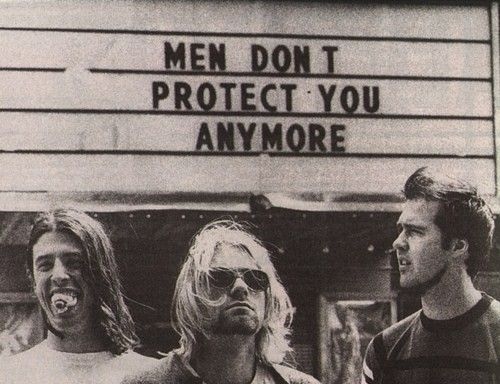 You could argue that this is the most “grunge” the band got and I guess I’d agree with that. It certainly is heavier and noisier than their second LP and doesn’t lean too much into more alternative rock. I have some personal favorites on this one so it’ll always be a good LP for me. What can be said about this that’s not already been said? A nice blending of punk, pop rock, alternative and grunge form well written, witty and intense songs. The range here is impressive, hopping from heavier rock gems (Smells like Teen Spirit, Stay Away, Territorial Pissings) to shocking quiet and darker tracks (Polly, Something in the Way) and hauntingly catchy pop rock (Lithium, Come As You Are). It’s easy to see why this album singlehandedly killed big hair music and knocked Jackson off the number one spot. The only real criticisms I hear are that the melodies on certain tracks are too similar to each other and that despite genre switches, they still sound the same. While I guess some chords are similar, I’d not say flat out the songs here are at all the same. And yes, I dare say that this is one of the best and most essential rock albums of all time and should be catalogued among the other great albums of the 20th century. A compilation of rarer material from the early singles, a John Peel live session and some unreleased material from around the first album, this album showcases quite a bit of variety. There’s some grunge here, some new wave-esque rock, some superb cover tunes, and some darker stuff that still rocks HARD today. This album is one of my favorites. There’s not a single skip-worthy track here. Released to quell the masses as Nirvana’s sudden explosion in popularity reached an uncontrollable level, this EP featured material that, for the most part, wound up being reissued on the Incesticide compilation, mostly due to the rarity of this EP. It was hard to get in the US (to this day, I’ve yet to find one) and the rarer Australian Tour Edition was released only in 5000 unit increments in each format (tape, CD and 12”). However, some of the tracks here are still fairly unique. The track “D7” at the time was not released elsewhere, the version of “Aneurism” was a demo version that wound up appearing on the box set, and “Even in His Youth” seemed a bit different than the b-side version. If you can find this, go for it, but be aware that unofficial reissues are floating around and prices vary wildly from reasonable to insanely expensive. The final studio LP from the band was released in 1993. The production here is raw and loud, much in the way of the Jesus Lizard; I guess it helps when you have the same producer. However, singles were remixed by Scott Litt supposedly to make them sound more radio friendly. This album is bold and dynamic, poking jabs at the band’s overwhelming popularity, the blistering hate they felt from critics, and the difficulties of handling both. There’s a lot more pain, sickness and darkness kicking around here but it pulls us in even more. I feel like every track here is a standout. It’s so different from Nevermind and much more personal. Needless to say, this one is my personal favorite. There are quite a few to choose from. To get a wide scope of their live shows, check out “From the Muddy Banks of the Wishkah” as it features material from 1989 – 1994. However, if you’re looking for single-show recordings, you can’t go wrong with “Live at Reading” or the live set that accompanied the reissue of Bleach. The Unplugged album is easily the band’s most famous set, featuring nearly all acoustic sets and a few songs the band teamed up with the Meat Puppets for. Most of these singles found their rarer tracks reissued on the box set, or, reissued entirely remastered as box sets of their own. This was done especially for Nevermind’s 20th anniversary specifically. The big single that’s been on the radar for collectors as well as fans is the “Pennyroyal Tea” single. At the time, it was issued only in Germany as was deleted/discontinued due to printing errors, thus making it the rarest single in the band’s catalog. The b-side “I Hate Myself and I Want to Die” was featured here but the version that appeared on the box set was incredibly different, which fueled the need to get this single all the more intense. Bootlegs of this are everywhere and are mind-blowingly epxensive. In 2014, a Record Store Day 7” was released and was promptly sold out and is, shockingly, once again very hard to find. Should you grab the special edition reissues? Um, yes. Even though I can’t afford them right now, it’d thrill me to have them. The alternative mixes, the demos and newer tracks that come with these are worth it to me. The “greatest hits” compilations (simply titled “Nirvana”) wouldn’t be a bad choice to grab as well. So far, it’s the only place to get the studio version of “You Know You’re Right” and some of the alternative mixes of singles. The box set “With The Lights Out” is arguably the most important box set for the Nirvana fan. Featuring over 60 rare tracks, demos, liver material and a full DVD of music videos, live footage and other chaos, it’s hard to pass this up. You’re better off passing these up entirely. I say that because it has been my experience that bootlegs are variable grab bags with mixed results. Some tracks have crystal clear soundboard quality while others were from handheld tape recorders in the back row of concerts—you can’t tell what you’re listening to. Hell, at times, tracks on these bootlegs aren’t even from Nirvana at all. I’ve seen some with the 60s psyche band of the same name or bands that I’m blown away that someone thought these were the same guys. And worse still is track names are wrong, recording dates are wrong, and at times the track in question is just Kurt jamming with another band (typically Mudhoney or Tad) and yet it gets credited to being all Nirvana—it’d be more appealing to have it say “Cobain with Tad!” or something…. And then there’s the price, which is usually INSANE for what you’re getting. So pass these up entirely. It’s not worth it. While I’m not surprised when some of the “kids these days” don’t have a clue who Nirvana is, at least this should help guide them into it gently. It doesn’t bother me if people dislike Nirvana even though the band’s been a personal favorite of mine, but you can’t argue that Nirvana has changed the face of music in the brief time they roamed the earth. Hopefully my small review post here will shine a little light on their albums and help folks find one they like. This entry was posted in Uncategorized and tagged Cobain suicide, Dave Grohl, grunge, grunge rock, In Utero, Jason Everman, Krist Novoselic, kurt cobain, Nevermind, nirvana, Pat Smear, With The Lights Out. Bookmark the permalink.